Witness was created for the Al Mutanabi Artist Book Project. You can learn more about the exhibition here. I developed Witness from a New York Times article that described the 2007 bombing of Baghdad’s historic street of booksellers during the American occupation of Iraq. I started by running the text of the original article through every language available on Google Translate. Then I printed out the newly transformed pages and bound them together to that Albanian, Esperanto, Georgian, Malay and Serbian and other descriptions of the massacre coexist with pages in French, Italian and Thai. 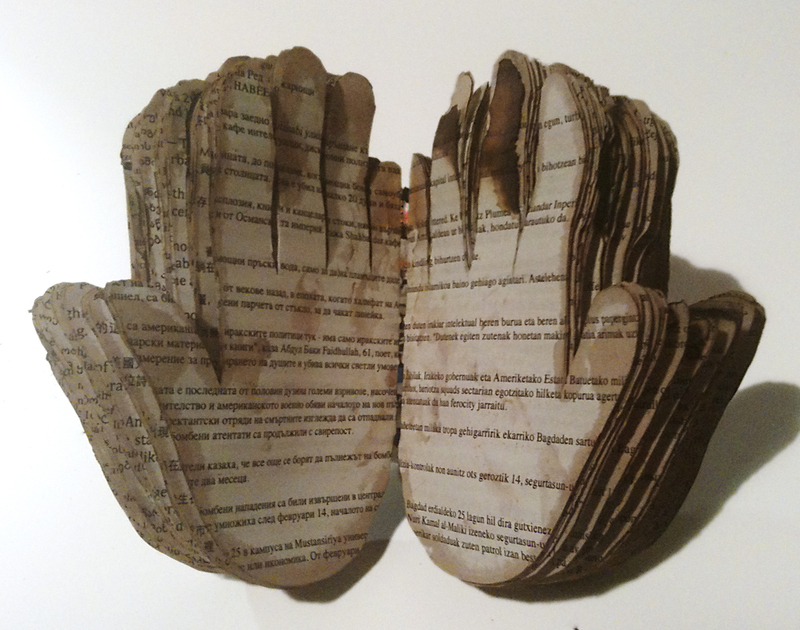 Next, I hand-cut each page into the shape of my own hand, sewed on hand-twisted book cords, then charred, dirtied and dyed the pages to emulate the fragmentary books that survived the bombing. In our age of constant, instant news and distribution, we are all witnesses; and, accepting the maxim that there are no innocent witnesses, all morally complicit to the extent we choose to look away or fail to respond.